Trumbull was the governor of Connecticut before, during, and after the American Revolution. He graduated from Harvard in 1727. Through trade with the West Indies, Jonathan Trumbull turned the small business he inherited from his father into one of the most prosperous in Connecticut. In 1736, the year before he married, Jonathan Trumbull purchased "Flora--a slave for life" with the aid of his father. (27) A few years later, Trumbull began a long career in the Colony's General Assembly. Among his duties were to enfore the Colony's Black Codes--laws applying only to people of color that circumscribed their freedom of movement and assembly. Twenty stripes were typically inflicted on those circulating in the streets after nine p.m. with no pass from their masters. Trumbull became the governor of the Connecticut colony in 1769. He was the only colonial governor to support American independence. Trumbull presided over Connecticut while slavery reached its peak, but also as it began to decline. As governor, he served ex officio on the Yale Corporation. As the spirit of independence began to sweep the country, Governor Trumbull was increasingly confronted by the contradictions between the institution of slavery and the principles of democracy (29). Governor Trumbull's own son, John Trumbull, published a scathing satirical attack on slavery in The Connecticut Journal and The New Haven Post-Boy on July 6, 1770. We are all of us of the same mind as we [were] when we asked this advantage of your honor last May[,] that our masters have no more [right] to make us serve than we have to make our masters to serve us. And we have [...] to wonder that our case has not been taking in consideration so far as to grant us our liberties. Leave not a stumbling block before ye at the day of judgment ... pray, which had you rather: choose to let the Negroes go free or lose your soul at the day of judgment? Now gentlemen, there is no lawyer, no temporal judge, but a spiritual lawyer and judge. ... Gentlemen, you'll think of our humble petition when you come to ... your deathbed. Your conscience then will smite you to think how you have wronged us, poor natives of our dear country Africa. You think you keep us alive but it is the Almighty that keeps us alive and provides us sustenance. 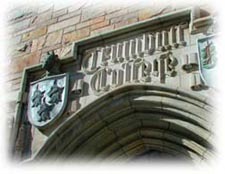 In 1779, Yale gave Trumbull an honorary degree. In 1784, Trumbull announced his retirement as governor a few months before the Connecticut legislature finally passed the "gradual emancipation" law, after discussing it actively for four years. Trumbull was a hero of the American Revolution. During his tenure as governor he presided over Connecticut while slavery was most prevalent, but he also cleared the way for gradual emancipation within the newly freed state.